Are you quitting EVE? Are you hours away from receiving a permaban? Or maybe you're just taking a break from the game? If need someone to give all your stuff to, I've got you covered. Tens of billions of isk have been sent my way because people know that I'll put their money to good use. Agent Malcolm Shinhwa bought 4,450 additional shares (including 985 shares purchased in Malcolm's name), sending us over the 420, 421, 422, and 423 billion isk marks. Malcolm earned a Quadruple Supreme Protector's Tip of the Hat™. If and when he returns to EVE, he will return as a hero. 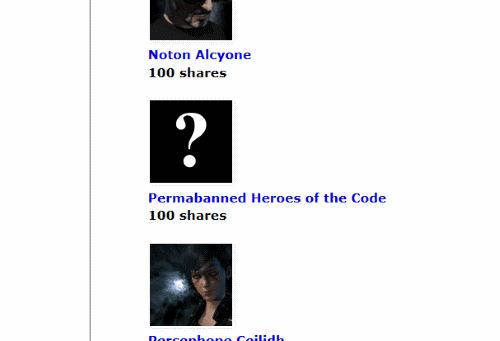 Agent Jonah Gravenstein added some isk in tribute to these fine individuals, who have voluntarily left EVE in protest. 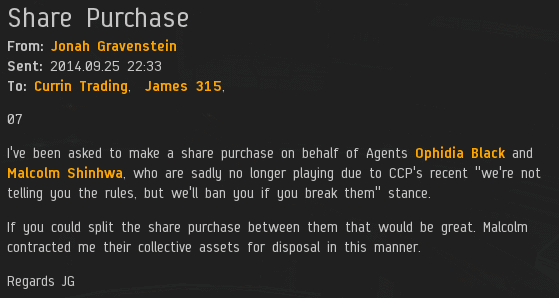 Ophidia Black purchased 985 additional shares by proxy and sent us over the 424 billion isk mark. She earned a Supreme Protector's Tip of the Hat™. And here's yet another option. Permabanned Heroes of the Code is not an in-game entity. It is the New Order's first "conceptual" shareholder. His/her/their/its isk is as good as anyone's. Moving along, Rouge Drex purchased 1,000 shares. Way to start your share ownership big! We moved past the 425 billion isk mark, and Rouge earned a Supreme Protector's Tip of the Hat™. Ryan Ottomeya is next up. 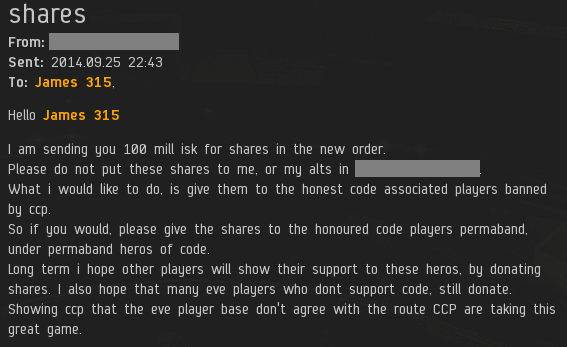 He purchased 350 shares and sent us over the line for 426 billion isk, earning him a Supreme Protector's Tip of the Hat™. Let's keep it going. Highsec needs us now more than ever before.